I've used Hazel for arrows for a long time, so I collected a range of woods and shoots suitable recently and here's what I came up with. All pieces where cut at the end of September and where straightened as they dried and some stubborn ones where straightened with a gas stove and careful bending whilst dry. From the left we have Hazel, Willow, Rose, Reed mace stem, Dogwood, Buddleia, Holly and Privet. they all look great - especially the 3rd and 4th from the left. 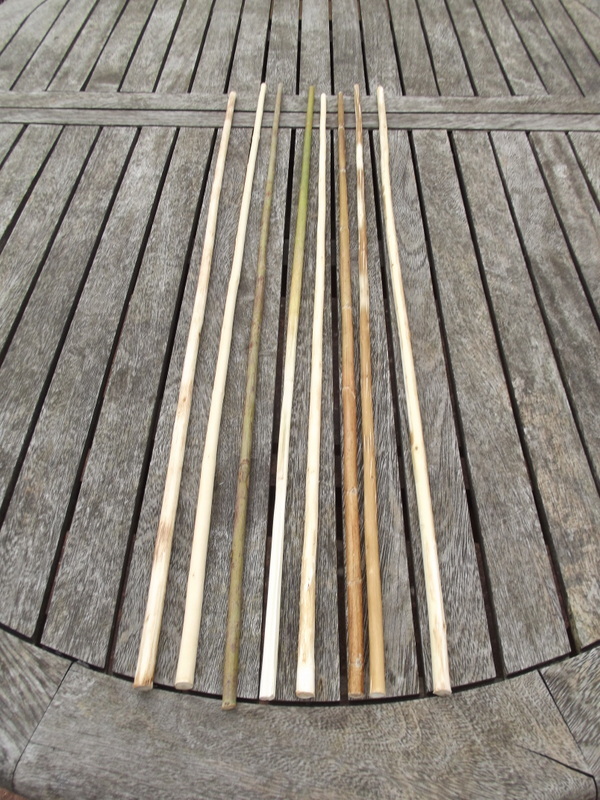 Does different wood effect the performance of the arrow, such as durability, weight on impact and distance and so on? Sorry to leave this hanging for so long! In short, yes. "Woods" like the Reed mace stem, climbing Rose and Buddleia have a large pithy centre to the stem, this makes hafting a flint arrowhead easy as you can just insert it into the pith and add pitch pine glue and binding to hold it, good for small game/fish and a light poundage bow, say about 30 Ib. Woods like privet and holly are much denser (about 0.70-0.80+ specific gravity) and would be better choices for a much heavier poundage bow. Willow and Hazel are somewhere in the middle, Willow being lighter and a little weaker than Hazel. By the way, Privet and Holly make good bows but Holly is notorious for developing splits during drying unless a large log is split into quarters for the staves. I've tried a thin Holly branch full of knots to make a bow and I was filling splits for more time than making a bow! Also Willow can juuust about make a bow (it is relatively weak in tension and compression) and no-one will recommend it, EVER! Hazel can be coaxed into a good bow, but you have to be gentle as the belly of the bow likes slightly fold in on itself if over strained. I've now done this twice and ruined potentially good knot less 6 ft staves.